If you are planning on seeing a concert or show at the Gorge Amphitheater in George, WA then trust me you are going to want to camp there. I have been to a few shows and half of the fun is just camping out and hanging out with everybody. Also if you look on a map you will see that it is in the middle of nowhere. People do get in their car after the concert and drive somewhere and I don’t recommend it. I have no idea where they are going because you are in the middle of nowhere. Camping is the only way to go and it is so much fun. It is one big party before, during and after the concert. I have done the tent way once and to be completely honest it was just fine. It actually was a lot of fun because it is at least a place to sleep that can somewhat protect you from the elements. I would recommend that you don’t bring your super turbo backpacking tent that is meant to summit Mt. Everest because there is a chance that it could get trashed. Remember you are going to be surrounded by a bunch of people partying. This would have to be the easiest way especially if you have a car the you can sleep comfortably in. We own a minivan that has stow and go seating so sleeping in the van is actually really comfortable. Plus set up and packing up is really easy. But if you don’t own a minivan or large car then this might not be ideal for you. It is the easiest way if you are a small group but if there is more than 2 people in your party then the other people will have to find somewhere to sleep whether it is a tent or a sleeping bag in the open. 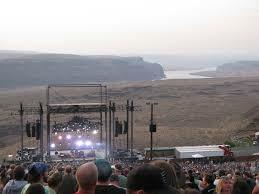 RV camping at the Gorge is the best way to go without a question. If you own an RV that is ideal but most people going to these shows do not own one including me. In this instance this is not a bad option. First you have to find a dealer that rents them out and you should be able to find one near the venue or in the Seattle area. You are going to get charged a little bit more but you are renting from a reputable place that will take care of you. The fee split between a number of people is not that bad. But you do have to sign your life away because they don’t want it trashed which I completely understand. This is not a bad option either but again you have to find a place and you will have some coordination as far as paperwork and everything that goes with it. But if it is a speciality place near the venue then you are going to have to book way ahead of time because it will sell out for the major shows such as Dave Mathews. In my opinion this is the best option because you have the website at your finger tips and you can search a number of areas where you can pick it up and then drive to the destination. It is extremely affordable especially when you split it up between a number of people. Both parties are covered by the insurance that you are required to get when renting from the site. Check out my review of RVShare Here. The only thing you really have to be careful of is most of them have a maximum number of miles you can drive per day. So make sure you don’t rent it from a place that is too far away. If you are going to see a concert at the George Amphitheater then you have to camp. It’s a part of the experience and you have no place to go after the concert because it is in the middle of nowhere. Prices vary from event to event and spaces are on a first come first serve basis. • Quiet time is strictly enforced from 2:00 am to 8:00 am. • Check out time is 10:00am on your departure date. • Underage use or possession of alcohol will not be tolerated. • No illegal drugs or drug paraphernalia. • No firearms or weapons of any kind. • No fireworks, camp or open fires. • No large parties, kegs or binge drinking devices. • Unauthorized vending of food or merchandise, including alcohol, is prohibited under WA state law. • You must possess a concert ticket to be in the campground. • Obey all posted “No Trespassing” signs. Just remember to be safe ad have fun.